I’ve been getting their meal boxes periodically for 2 months now and I wanted to summarize my thoughts on the program. This is a data dump of the features our family likes, as well as the things our family doesn’t like. I’ll try to organize the thoughts so it can be useful to someone. Mail-order convenience. EVERYTHING you need for your meal (except oil, salt, and pepper) is delivered to your door. This includes many staples you might have in your house already, for example: eggs, mayonnaise, and dried herbs. The highest quality ingredients. This came up in particular the first time we had a chicken dish earlier this month. It was moist and flavorful. When I buy other-than-organic chicken now, it seems dry to us. Even if I make a stew or soup. It seems dry…and less flavorful. 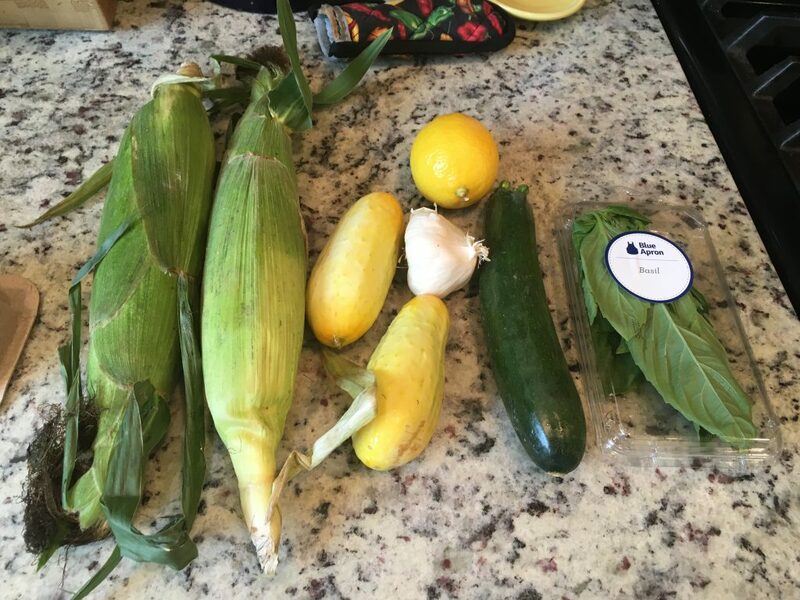 Blue Apron is sending us responsibly-sourced, often small-farmed, mostly organic ingredients. I’ve done a few sauces and salad dressings and each and every one is made from scratch. The vegetables are very good quality. Don’t worry, all the packaging is recyclable. Easy-to-follow recipes…written such that you can replicate the recipe with your own ingredients. What do I mean by this? In other words, if our family really liked the catfish meal, I can get the ingredients and make the meal again. The recipes come on glossy, brochure-quality cardstock. It’s easy to put these in a binder for future reference. Truth be told: all their recent recipes are available to anyone without even signing into the website. A chance to put variety in our dinner planning. For years I have had numerous “go to” meals for weeknights (pasta bake, tacos, burgers). With the 30-45 preparation time, we can have something more interesting than “baked chicken and rice” for dinner. Cheaper than eating out. Yes, you heard correctly. Now that I’m through the new-customer promotion, I get billed around $70 each time I receive a box with two dinner meals: $35 per dinner, or further broken down to about $9 per person per meal. A trip to Chick-fil-a for my family now costs $35-40. A trip to a full service restaurant can easily double that cost once you include gratuities. So, although not by much, Blue Apron costs less than eating out, and the ingredients are recognizable and high-quality. Fresh choices every week. Blue Apron rotates their menus such that a recipe doesn’t repeat itself more than annually. But don’t worry: you end up with the recipe card and you can repeat the meal on your own dime. If you don’t like any of the options in a given week, just cancel the delivery (which has to be done one week in advance) and you don’t pay for that week. Get the kids involved! This is fantastic for parents who want to introduce their children to cooking in an easy way. Some of our boxes have even included insert pages just for the kids. My sons are a little older than the intended audience for those pages, but Timmy especially enjoys reading about the farms from where some of the box came. Portion control. A dinner for four contains reasonably-sized portions for four adults. 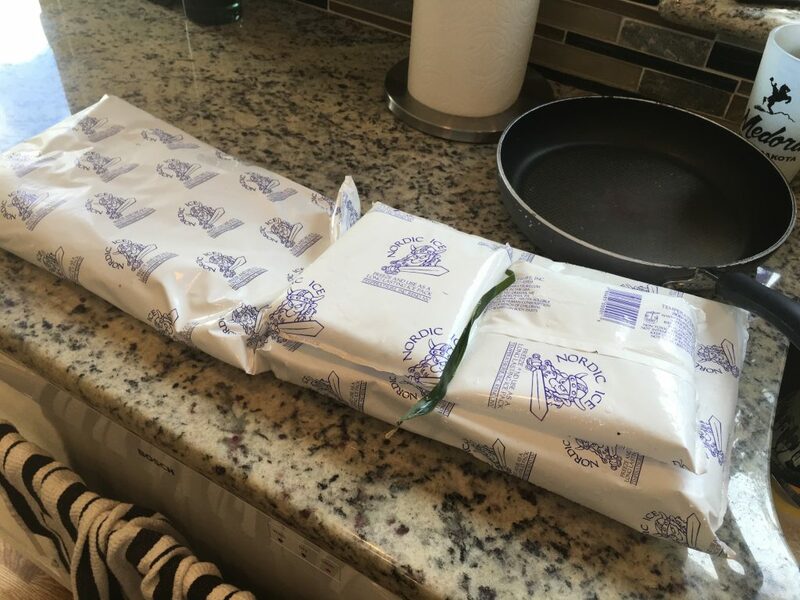 My husband and I usually are pretty full after our Blue Apron portions…often I can’t finish my meal! My still-growing wrestling and cross-country-running sons often are still hungry after eating their portion of the Blue Apron meal. So they end up supplementing what’s usually a pretty-fancy dinner with something on the order of cup of Easy Mac or a bowl of cereal. Picky eaters beware! We make routine modifications to the menus to accommodate our picky eaters. I’m the only one in the house who will eat squash, eggplant, cucumbers, and tomatoes voluntarily. About half of the meals I’ve received include freshly-cut and prepared portions of those vegetables, and I end up either saving all of that vegetable for myself, or else omitting it altogether, instead paying forward the vegetable into one of my lunch salads. Delivery options. Blue Apron started by telling us my meals would arrive on Fridays. Friday deliveries didn’t work as well for us because weekends are when I tend to do my own favorite recipes for the family, or we are going out to eat with friends. On Sundays, our sons have bible study at church and our church provides the boys dinner. So I try to cook one of the dinners either Friday or Saturday and save the second dinner for Monday. We pick the meal with, for lack of better terms, longer staying power, for Monday. So we recently switched Blue Apron to Wednesdays, but I haven’t received a box on a Wednesday yet (my next box arrives next week). Costs less, but not inexpensive. Even though $35 per dinner for 4 is cheaper than our family eating out, I can still feed my family a home-cooked meal for less cost. I’ll use one of my family’s favorite dinners as an example: a grilled Costco tri-tip, mashed potatoes, and salad will cost less than $20 (the tri-tip will cost $13-15). I can even get more simple: turkey tacos can be done for less than $10. Blue Apron customers really ought to have some basic cooking skills under their belts before investing in a program such as this. Blue Apron does NOT offer cooking lessons or too many tips/techniques. Each box will have a fun fact sheet about some of the more interesting ingredients you may receive (such as the “fairytale eggplant” I’ve gotten a couple times). Know how to slice and dice vegetables safely, that’s a good start. That being said, be sure to have some equipment on hand to make this a success. Have a good-quality chef’s knife and cutting board, there’s a lot of chopping and cutting to be done. In addition, if you follow the directions precisely, you will want numerous little food preparation bowls handy to have chopped vegetables, herbs, and aromatics ready to toss into the pan as needed. Finally, one medium to medium-large pot and one 12-14″ frying pan will complete the suite of what you require. Blue Apron has a “market” at their website to sell many of the tools of the trade. Have lots of bowls ready for your chopped, diced, and minced foods. Based on some of the research I’ve done, Blue Apron rotates their recipes such that you won’t see a repeat of a recipe for at least one year. For each delivery in our family’s “once a week, two meals for four people” plan, you will be presented for 4 options, from which you will choose two for a delivery. You can also opt to have all four recipes that week. 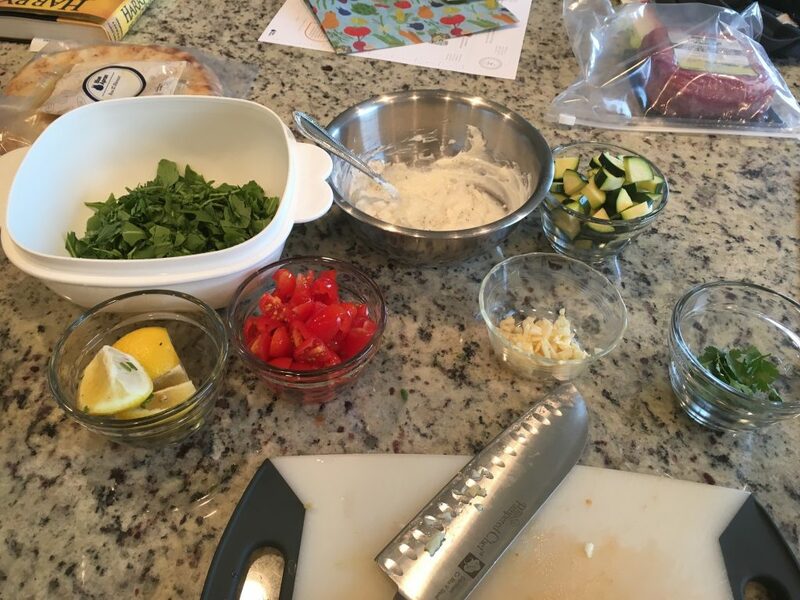 In our family, the deal is that if I can’t find two out of the four recipes that my boys will at least try (sauteed squash or stuffed peppers wouldn’t be touched, sorry), I will skip that week’s delivery. We only end up taking deliveries about twice per month: giving us 4 meals for about $140. Most of the meat dishes I’ve made have involved pan-frying with olive oil. 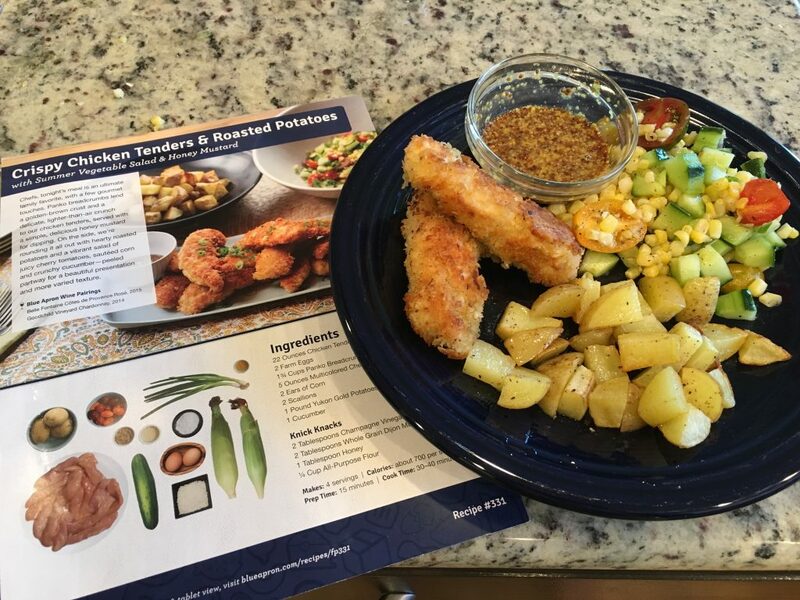 Blue Apron meals aren’t meant to be “diet plans” per se, although I’d argue the quality of the ingredients and the reasonable sizes of the dinners isn’t bad for someone who’s trying to watch his/her calories. As mentioned above, the Blue Apron box will include EVERYTHING you need except for oil (for sauteeing, greasing pans, and as an ingredient and vinaigrettes and sauces), salt, and pepper. This is great because you aren’t running to the store for something you perhaps forgot, but also could be a pain because you might have a dozen eggs in the fridge already, but the box will include the two eggs you need to make meatballs. Virtually all the packaging is recyclable. There are instructions on the website about how to dispose of everything, including the ice packs. It’s certainly handy to save as many ice packs as you can, but after a few deliveries, you’ll have more than enough of those for any picnic or camping trip. This is one box’s worth of ice packs. I have saved about 10 of these for coolers, but now I’m disposing of the inside material (non-toxic) and recycling the plastic. Blue Apron suggests that most of their meals can be prepared in less than 45 minutes. I think that’s aggressive. If you are well-focused and good at chopping vegetables, sure. When my sons get involved, it usually takes us closer to an hour. Some of the cooking times didn’t work as well for us either. I’ve overcooked some vegetables…and undercooked some others. That might be because we live at 6800′ elevation and our boiling points aren’t quite the same. 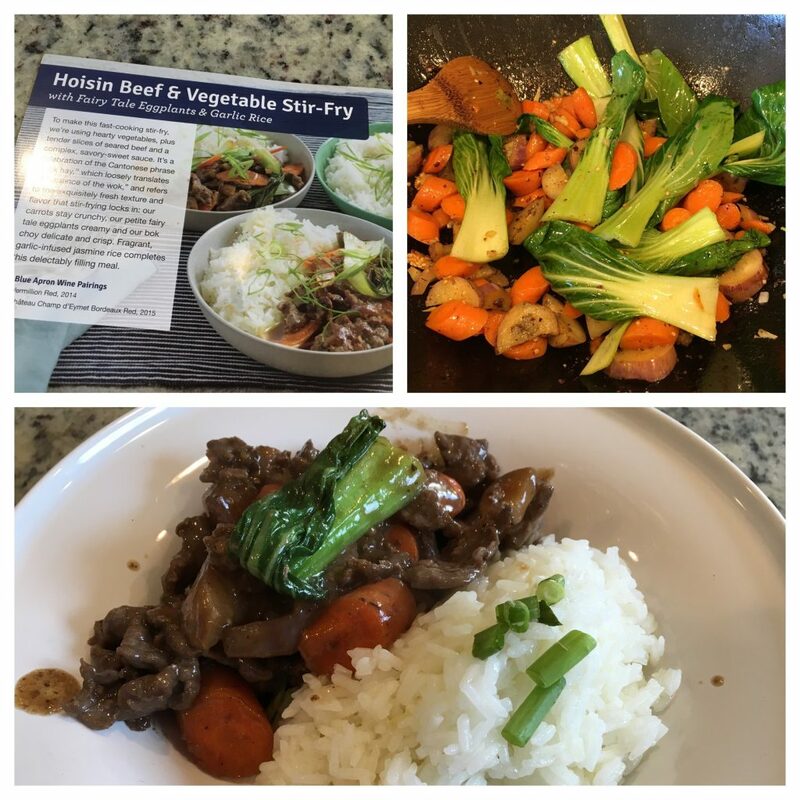 I think programs such as Blue Apron are fun and can be educational for the kids. It introduces variety to your family’s meal planning, and the company makes it super-easy by shipping everything directly to your door. They have priced themselves very carefully by keeping their costs lower than restaurant meals, but this level of quality and convenience will cost much more than getting the food at your local grocery stores and farmer’s markets…perhaps by double! I have yet to see an additional promotion come along after the new customer deal; after you take a couple deliveries, the company presents you coupons that you can email to your friends to try out the program. There are two programs at Blue Apron: dinners for two, and dinners for four. For dinners for four, you can choose delivery of two meals, or four meals, per week. The pricing of dinners for four is pretty solid no matter what you choose: approximately $35 per dinner for four or just under $9 per person. If you choose a dinner for two, you will receive 3 dinners per week at about $60 per week, or about $10 per person. I’ll stay with the program for now, and be sure to keep on top of the schedule to make sure we don’t receive arbitrary deliveries, which is definitely a possibility with Blue Apron. If you ignore the website for too long, boxes will just show up at your door….and charges will just appear on your credit card. If we get sick of it, it’s apparently pretty easy to cancel.